Last night saw the PLACE-sponsored launch of the Forum for Alternative Belfast at the Black Box in Belfast's Cathedral Quarter. The launch saw a great turnout, with presentations on the Forum's key areas of interest by its members, followed by a discussion panel led by Shane O'Toole. "We feel there are a lot of vacant sites left close to the city centre, and we need to concentrate on rebuilding that centre and its connections to the wider communities where people live. 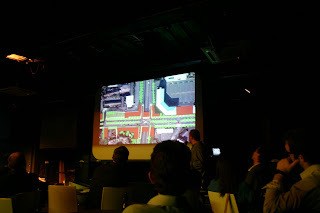 "You've still got a city centre which is pretty empty at night, and even with 15 years of boom we haven't solved problems like the Westlink - it divides the city from its city centre. "We're talking about simple things. "A city doesn't feel safe if you're walking past a vacant site, especially at night, and that's still the characterisation of much of Belfast city centre," he said. The Forum has a number of short-term projects which they think could change aspects of the city. 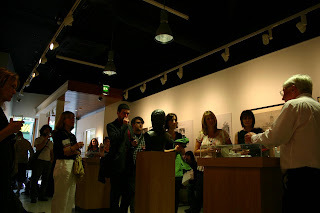 Meanwhile, back at PLACE we had Late Night Art for June, with an introduction to the Non-Iconic Mackintosh exhibition by Gordon Ash of Keppie Design, and the launch of weePLACE003 - a selection of prints by Belfast artist Robin Cordiner: more on those projects from the PLACE website.